What JoeBloggs said. In TMDB we can change wrong data, add information etc. Just think about the problems you encounter if you want to add a movie poster in IMDB - you have to pay for it! TMDB is the better choice, I think. Ranked according to the average rating > highest first the list shows first the film "Billy Frankenstein", a film with no rating, 2 views, 6 listings and zero likes. In contrast, the well-known "Hollywood Chainsaw Hookers" with an average rating of 2.9, 455 views, 202 listings and 110 likes appears on page 3. Page, not position. This can't be intended effect of your calculations. You might note also that the ranking according to popularity reflects reality well. This strange behaviour of the average rating ranking is not an exception, I have seen this quite often. Maybe it mainly appears in lists where some films have very low numbers of user interactions? An unusual behaviour of your algorithm when some of the numbers are zero, maybe? Of course I don't know what your weighting criteria are. But shouldn't films with no rating always end up at the bottom of the list when sorted according to average rating? (I have seen lists where films with no rating and marginal view numbers topped the list.) When I sort the list according to user rating, I am looking for film recommendations from the community. Otherwise I would sort the list according to popularity/views. What I also don't understand: When only I gave the film a 3.5 star rating, the weighted average was 3.4. When another user gave the film a 3 star rating later, the weighted average was still 3.4. How can the weighted average with one rating be different from this rating and not change, when another rating is introduced into the equation? Anyhow, I am now aware of this problem and check the rating for each film in the list individually. Thanks for looking into this. There is definitely something wrong with the way average ratings are calculated and compared. The average rating is now calculated as 3.4, what is impossible, since there is only n=1. Furthermore this film is shown as the one with the highest rating, when the most popular film has a 3.8 rating. Increase to ten the "Favorite Films" list! I like the restriction to four. Keeps one focused and encourages rotation in the displayed four films. Annoying behaviour, but difficult to implement. How can one distinguish between attention seekers and people who went to a film festival? And sometimes the release is not synchronised - so lock the rating for people from one country, but not from another? I guess, we have to live with it. I find it also difficult to follow replies to my comments. I get an email notification, but why don't I see those replies in my incoming stream? I even see, when people I follow answer to somebody else. Strange and quite an obstacle for a flowing discussion. 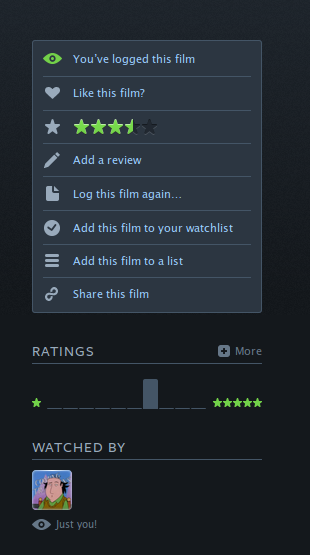 A similar approach as suggested for the People page would be good for the selection of lists that are displayed on a film page. I always see the same "All films ever made. A comprehensive 50,000 item list. 2,483 likes" lists for genre films - so I don't even look at them anymore. Great idea that I would like to see implemented. Also it would be great if items in the activity stream wouldn't look all the same. At the moment it is difficult to see at a glance, if somebody like my review, rewatched a film or followed a new person.